If a Tree Falls in the Forest, Does Anybody Clear it? When I go Mountain Biking, I always wear a pack, and I carry the usual stuff in it that every mountain biker should have. Spare tube, patch kit, and tools. Since I work in a shop as a bike mechanic, I tend to carry more tools than most of my riding buddies. But there is one more tool I never go riding without, and they probably don’t sell it at your local bike shop. Quickly and easily give something back to the trails that you are riding. Of all the tools in my pack, my pruning saw is probably the one that gets pulled out the most. I don’t have flat tires or mechanicals very often. On the other hand, there always seems to be some brush that can be cleared from a trail to make it nicer. Downed trees on trails are the norm after storms, especially in the spring, when there are few trails that haven’t seen some winter windfall. 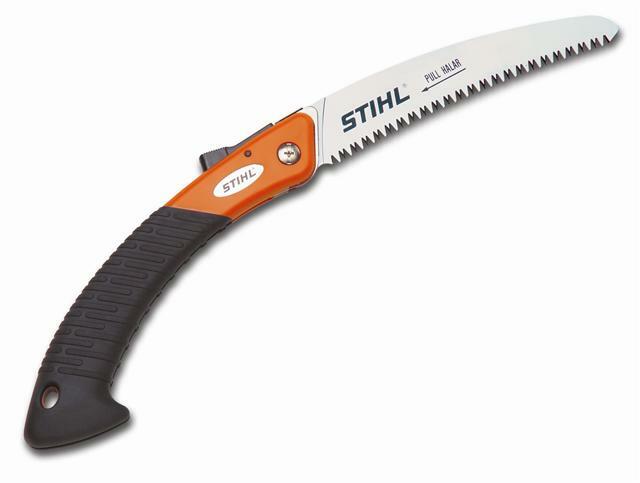 One of these little babies, (get a good one, the best I have used are made by Stihl,) can cut down a tree up to 10″ thick, if need be, and can also double as a survival tool, if you ever need to build a splint or a stretcher out in the woods during a worst-case scenario. There is really no excuse to ride past low hanging branches, or brush that is encroaching on the trail from the sides. Having a folding saw with you on a ride makes it easy to give something back to the trails, and makes a great excuse to stop for a rest! Remove fallen trees before any more riders need to carry their bikes over them. If you find yourself carrying the bike more than you are riding it, then it probably means that more people in your community should be carrying saws! Your local bike club should be donating one of these to every member. 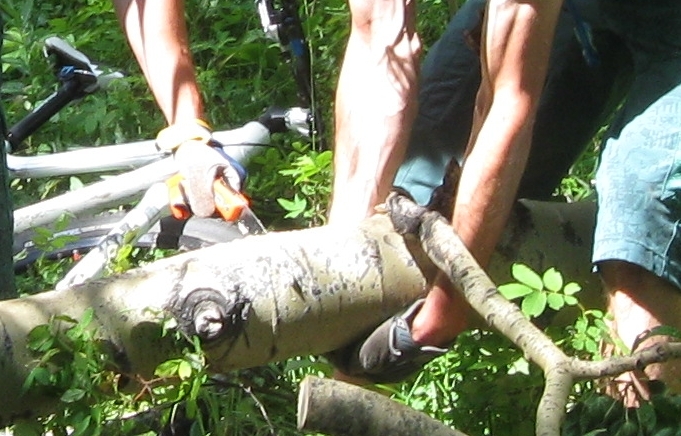 If they aren’t, bring it to their attention, as an army of riders equipped with folding saws will do wonders for keeping trails in great shape. I just went on a ride today and saw one of these for the first time. It’s the first weekend that we’ve been able to hit the trails in Eastern CT since the wicked blizzard hit, so we had a LOT of cleanup to do. My buddy pulled one of these out of his pack, and it worked wonders! I’m getting one of my own asap! Good Idea. It sounds like you easterners might have a lot of trail maintenace ahead of you this spring after those record snowfalls! Have a great riding season.